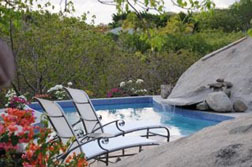 We recently visited a new villa to our program, On the Rocks on Virgin Gorda. Since we were there, we also stopped in to see a longtime favorite, very nearby Sol y Sombra, and meet with the managers of many of our Mahoe Bay and Leverick Bay Virgin Gorda villas. 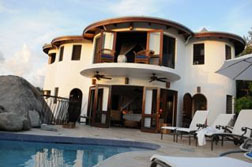 On the Rocks is a custom built brand new 4 BR villa which has an open living/kitchen area. No a/c in this area but the breezes should be sufficient. The living area has a flatscreen TV and an exposed boulder in the interior. The villa has a blue/white theme and has a very crisp/clean feel. There is a gorgeous dining table that can seat at least 8 when the leaf is in and has lovely place settings. Every little detail was very well thought out. Kitchen has a WOLF stovetop, stainless steel fridge and appliances, a granite sink. These custom pieces give it a very luxurious look. There is a telescope and binoculars to check out the views of Tortola and boats. There is a cute bar nook in the small hallway from the kitchen to the master bedroom. The master bedroom is the only bedroom that is a part of the main pavilion. There is an outdoor garden view porch area off the master bedroom which gives the guests an opportunity to get away from their party if they need to. There is a completely outdoor shower which is very romantic. A pathway leads from the main pavilion to the 1BR pavilion which also has a completely outdoor shower area. The pool is almost completely private. I don't think it would be possible for any neighbors to see into the pool area as there is a large boulder which the pool was built on one side of. There are a couple of hammocks for lounging. It is possible for elderly to stay in the main pavilion as the master bedroom can be reached wouthout using stairs. However, there are a short flight of stepts leading from the main pavilion to the pool area. This villa is great for couples as no one will really feel slighted although views differ. A 2 story "Rapunzel like" pavilion houses the last 2 bedrooms. There is an elegant and classy stairway leading up to the 2nd bedroom in this pavilion. Both of these bedroom have partially outdoor showers. Most of this villa is circular giving it a custom and unique look. The exterior of the house is stark white with wooden trim. The owners of the house have poured their heart and soul into every detail and aspect. 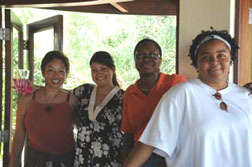 They respected the land as much as possible throughout the project. On the Rocks can be paired with nearby Sol y Sombra (which can accommodate 10 guests) for a total of 18 guests. Just to let you know we had a great vacation at Sol y Sombra. Everything worked perfectly. (We had a great) air charter, our car was waiting for us at the airport, provisioning was as requested, and the housekeeping team was excellent and very helpful. Our chef produced some great meals. Of course the villa was also fantastic. We would recommend all of them to anyone. Thanks for all your help in arranging this excellent vacation. "Beautiful. Loved, Loved the view and the pool at Captain's House. It was so nice to swim first thing in the morning and swim at night before bed. The villa met our expectations... and more!" "I just want you to know how much we are enjoying ourselves & this house (L'Esperance). Thanks so much for steering us to this house and helping us get ready to come over. We are just having a very special time." "It (Sea Lark) had everything we needed, a pool, which was a bonus, and the most gorgeous views we could imagine. This entire experience far exceeded our expectations. Hands down, it's better than staying in any of the top-notch hotels here. Very convenient and a home away from home."